In a pre-recorded interview, Hans interviews Bob Payne, past President of the Coffs Harbour RSL Sub-branch. Hans and Bob discuss the history and events surrounding ANZAC Day and the campaign at Gallipoli, - as well as accounts of ANZAC involvement in more recent times and information about ANZAC commemoration services. Click here for details of ANZAC Commemoration Services. The Community Show will feature an interview with Martin Cochrane, the President of the Banana Coast Radio Controlled Flyers Club. Martin will talk with Rita about Flying radio controlled (RC) models, and how this provides an exciting hobby which offers challenges and rewards to the young and old. In a second interview, Rita will talk with Eve Colley, the Publicity Officer of the North Coast Regional Botanic Garden. 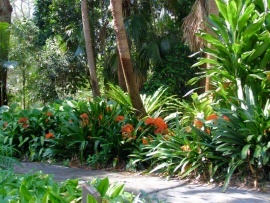 Eve and Rita will discuss features of the Botanic Garden, - which include a natural forest and mangroves, as well as plantings of rare and endangered Australian species, along with exotic plants from other sub-tropical regions of the world. On Thursday 18th April during the Community Show, Heather interviewed Gillian Hobson, the Secretary of Riding for the Disabled, Coffs Harbour. Riding for the Disabled is a volunteer organisation providing equine assisted activities for people with disabilities, - to develop and enhance their abilities. Heather and Gillian discussed how the organisation provides those activities, as well as the range and variety of activities. Gillian also spoke about their fund-raising efforts and the ongoing need for volunteers. Thursday 11th April, 2019 (The Community Show : 9.00-10.30am). Val interviewed Jenny Wiseman from the Zonta Club of Coffs Harbour. Jenny spoke about the Zonta Club and how it works to improve the health and well-being status of women. The Zonta Club supports a wide range of women's services, and Jenny discussed some of these, including, the Warrina Women’s Refuge, the Breast Cancer Care Service, and the Coffs Harbour Women's Health Centre projects. On Thursday 4th April, (during the Community Show), Fran interviewed Judy Bailey, who was recently named the 2019 Coffs Harbour Citizen of the Year. Judy spoke about herself and her interests as well as her involvement with the Lioness club and its accomplishments. Judy also discussed the wide and varied range of volunteering activities that she has been involved with over the past years. On Thursday 28th March, (during the Community Show), Max interviewed Bethany Simmonds, the Chief Executive Officer of Coffs Harbour Community Transport Company. Bethany spoke about how the Community Transport Company provides transport solutions to the elderly, people living with a disability, isolated and disadvantaged people. Also discussed were the wide range of services on offer, and how the community can make use of those services. Thursday 14th March, 2019 (The Community Show : 9.00-10.30am). Max interviewed Keith Bancroft, the Organiser and Convenor of the Coffs Scrabble Club. Keith gave an in-depth and informative overview of Scrabble, along with highlighting the enjoyment it provides, - as well as its language and inherent education. Keith also spoke about the club and presented some very interesting statistics and stories relating to Scrabble. During the Community Show, (Thursday 7th March), Rita interviewed Aunty Bea, about the upcoming Women of the World celebration. Aunty Bea spoke about the history of the event, as well as its significance and relevance to Coffs Harbour along with the events and activities planned for the day. Rita interviews Jonny Shuttleworth, the Organiser of Coffee 4 Blokes. Coffee 4 Blokes is a new initiative on the Coffs Coast, and Jonny spoke about the origins of the group, the meetings, its aims and the support given.